Last night I woke up in the middle of the night to a strange sensation. There was a gentle rubbing on my back alternating with four or five pats and cycling back-and-forth between the two. It took me a moment to figure out what it was that had woken me up. Eventually I realized that Jen was burping me in her sleep. I took a mental note of this before drifting back to sleep. The guys were a little groggy and a little cranky today because yesterday they had to get their first serious round of vaccinations. This left their legs sore and made them potentially a little feverish. The very nice woman in charge of ruining babies' days by injecting them put Peanuts themed bandages on their legs which begs the question: "Does any child in 2012 have any idea who the Peanuts are?" Today we had a fairly full day. We checked out a day care location in the morning, took the guys into town to have lunch on the green by the library, then off to another day care location in the afternoon. I got them both bathed and cleaned up which lead to the above picture which I hypothesize may be the greatest beefcake shot that has ever been taken. Elliott is a world class beefcake. After all of this I had every intention of cleaning up the kitchen but instead I fell asleep and woke up moments before we were to get a visit from our friend Heather. 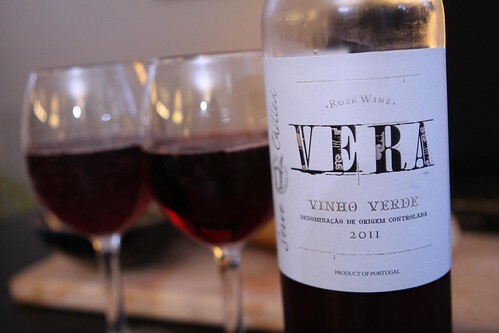 For wine I poured this 2011 Vera Vinho Verde, a super-dark slightly effervescent wine. This was mostly for the ladies. You may know from reading the blog that I am a little partial to beer. 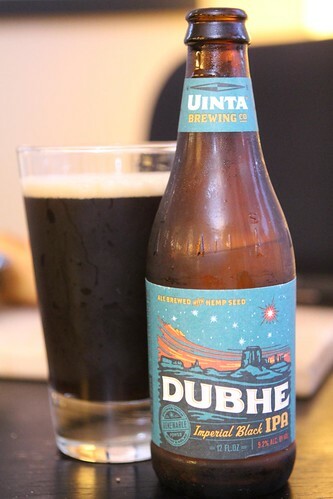 For the men I poured this Dubhe Imperial Black IPA from Uinta Brewing. Technically I was the only man present. 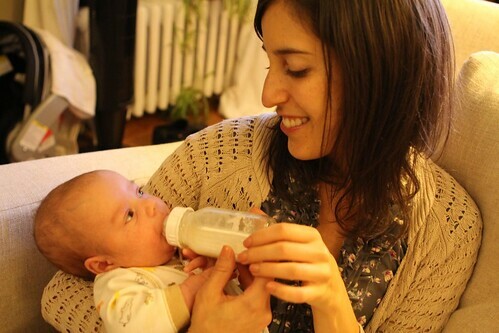 I can only be classified as a man when in the presence of two women and two tiny baby boys. In any other setting it is debatable if I am a man at all. This beer was great. It had a fairly strong alcohol taste thanks to the high ABV but it was right up my alley with a nice chocolate and coffee taste from the roasted grains. After the fact I learned that this beer was brewed with hemp seeds which was a little more hippie than I'd been planning on but made for a very nice beer indeed. 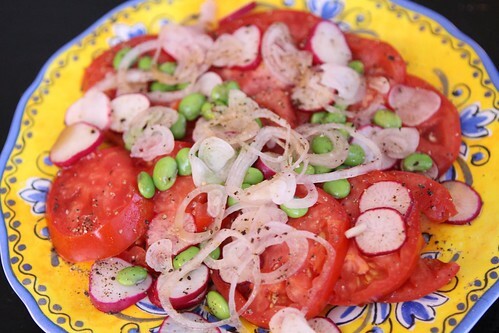 In honor of our dinner guest I made a "healthy" meal starting with this tomato and radish salad with steamed edamame. The tomatoes and edamame were from the farm and the radishes from the local farmer's market. I also added some slices of farm shallot, soy sauce, rice vinegar, and black pepper. 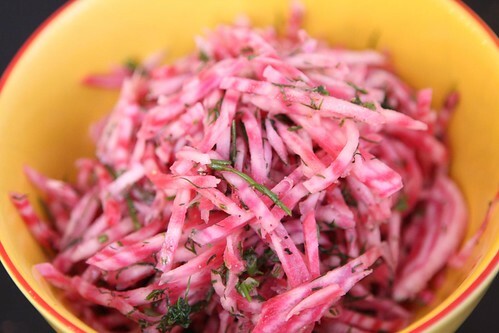 I also made a salad with julienned farm Chioggo beets, lime juice, olive oil, and dill from the farmer's market with a little salt and pepper. 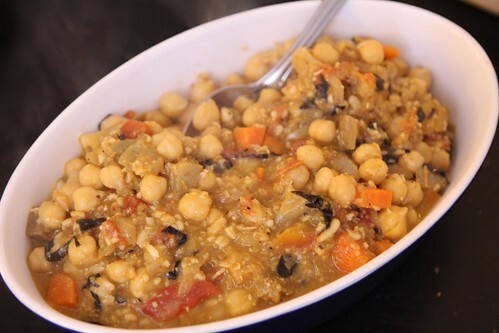 For the final course I soaked some garbanzo beans overnight then cooked them along with some garlic, farm shallot, farm onion, farm jalapeno, farm purple pepper, farm eggplant, carrots, and farm tomato. I added a little vegetable stock, Proseco, salt, and pepper. At the end I tossed in some of the purple basil leaves from the farm and toasted some pine nuts, ground them with a mortar and pestle, and folded them in. The pine nuts added a nice creaminess and rounded out the dish rather nicely. They also made me want to give myself a pat on the back for thinking of the idea. After an extended sleep this morning snuggling with Martin and an impromptu nap with him in the late afternoon I'm actually feeling pretty lively at this late hour. I'm excited to wrap up the evening, watch a little television, and perhaps try to get upwards of five or six hours of sleep. More Wombat visitors tomorrow so I'll need my beauty rest even though no one has ever so much as glanced at me in their presence. Prior to today, Nate H. was the only person I'd ever heard of sleep parenting. He swaddled in his sleep. He would swaddle a non-existent baby with the sheets. Then sometimes he would pick up the phantom baby and walk him over to my side of the bed and try to hand him to me. Now that is a little creepy.